SIIG's SuperSpeed USB 3.0 to SATA 3.5" Enclosure is designed to enable 3.5" SATA hard disk drives to work with your USB 3.0 enabled desktop or notebook computer. This USB 3.0 enclosure instantly adds large capacity mobile storage of up to 3TB capacity to your system, delivers maximum data transfer rates of up to 5Gb/s (10 times faster than USB 2.0), and allows you to hot-swap the enclosure (connect and disconnect) without first turning your system off. 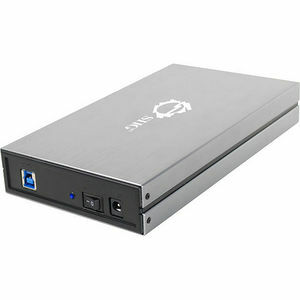 This driver-free enclosure is an excellent mobile storage solution for transferring large volumes of data at high speed between your external SATA hard disk drive and the computer. The SuperSpeed USB 3.0 to SATA 3.5" Enclosure conforms to USB 3.0 Specification, Revision 1.0, Serial ATA Specification 2.6 and USB Mass Storage Class Bulk-Only Transport. It is also FCC & CE regulatory approved and RoHS-compliant, fully compatible with a wide variety of Windows operating systems and backed by SIIG's limited 5-year warranty. Note: Windows 2000, XP (32-bit), Server 2003 (32-bit) can't support more than 2TB capacity. This is an OS limitation.